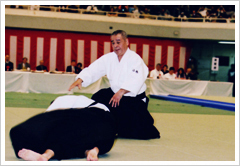 Aikido Kobayashi Dojo is an organization founded by Yasuo Kobayashi soshihan (principal shihan) in April 1969 in Kodaira, Tokyo. With the ideal of spreading aikido to many, we strive to instruct aikido to many. Also, the uchideshi (live-in training) program of the dojo fosters many aikido instructors. Our activity is not limited in Japan: we periodically dispatch instructors overseas, accept trainees from inside and outside of Japan, and arrange Musubi fund (a scholarship program for trainees from foreign countries) to support trainee financially. In 1986, we were awarded by Japan Budo Council at Budokan for excellency. We were the first to be awarded as a private organization. As of August 2003, we have about 120 affiliated and directly controlled places for training. Kodaira dojo in the suburb of Tokyo as the center, the places for training spread in Tokyo, Saitama, Kanagawa, Chiba and more. The countries we periodically dispatch our instructors include the United States, Canada, Russia, Argentine, Brazil, Germany, the United Kingdom, Hungary, Poland, Burgaria, Sweden, Finland, Norway, Iceland, Greece, Iran, South Korea, Taiwan, and Austraria.